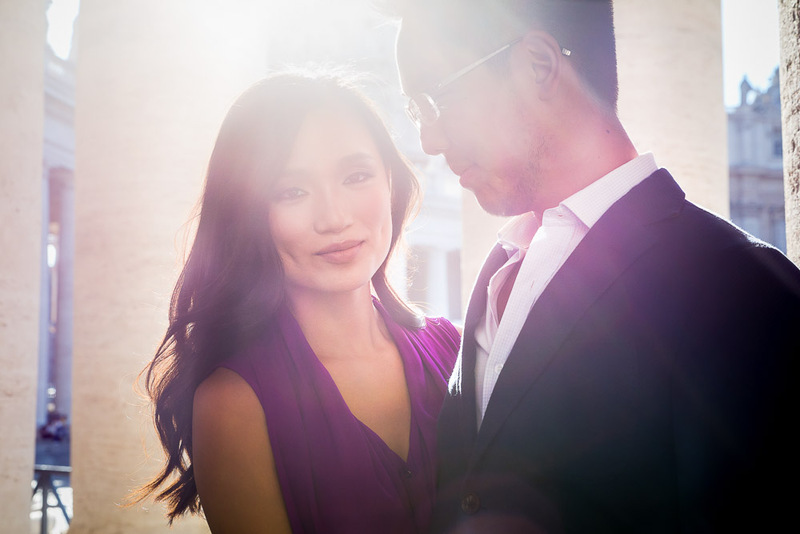 This was just a fantastic pre wedding and engagement style session. With a minivan available to reach all the locations, it also provided a place to change outfit. So we had 4 hours ahead of us and three outfit changes. Let’s walk through the images as there is a lot of great pics see! 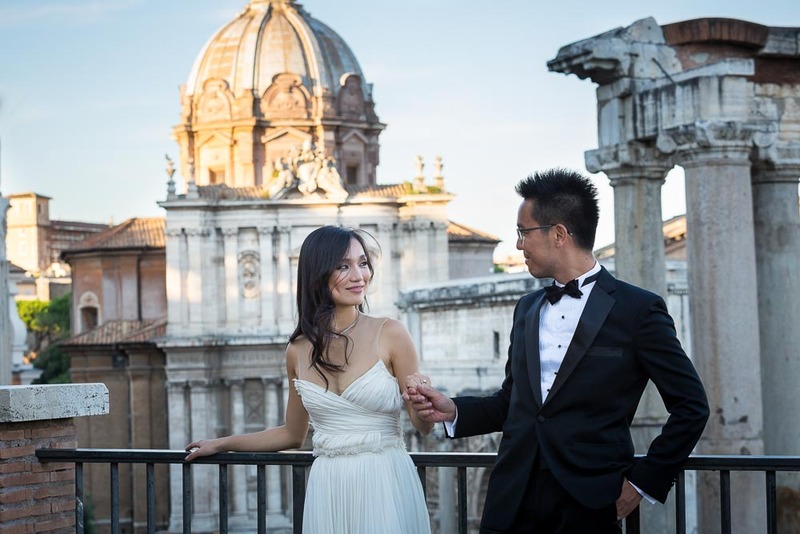 We started at Castel Sant’Angelo wearing violet casual taking pictures on top of the bridge to get warmed up. Then making our way down below the Tiber river bank. The light was just spectacular down there and after overcoming some initial difficulties we were able to capture some very nice imagery. 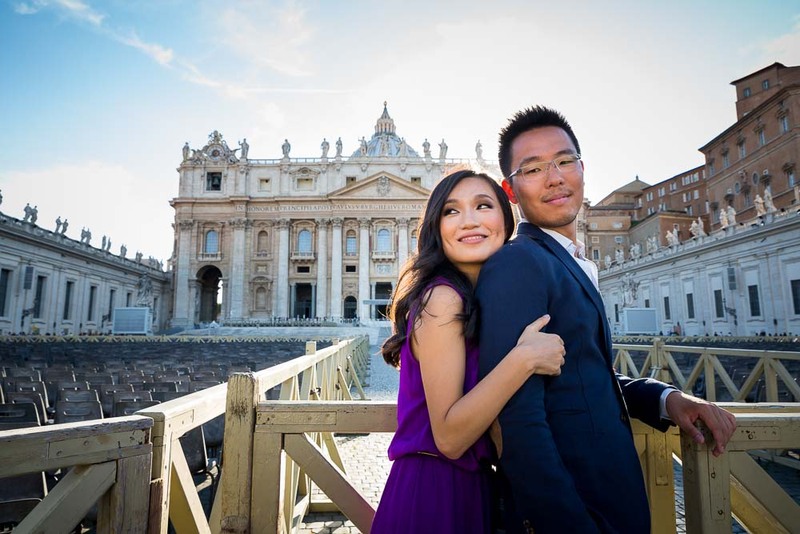 We continued the photo shoot with violet casual and after a very short ride on Via della Conciliazione we reached the breathtaking view of Saint Peter’s square. After a quick water break we were back to shooting starting underneath the fantastic colonnade. 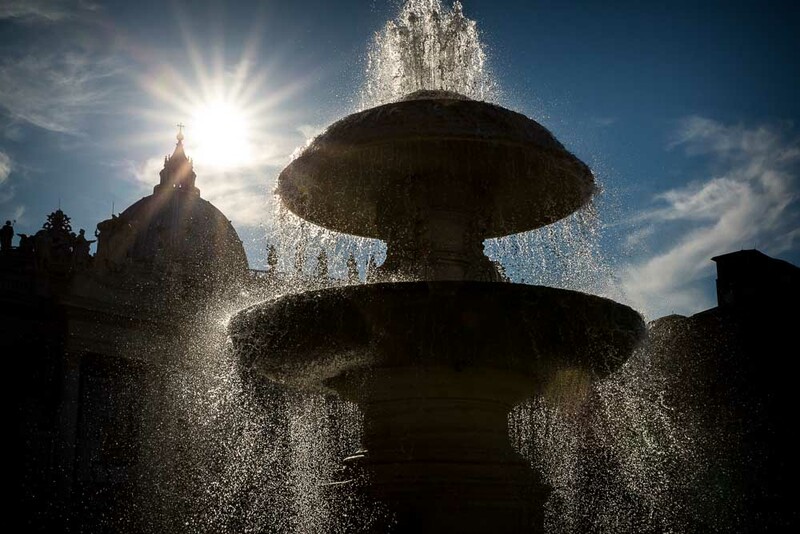 Capturing glimpses of the Basilica while shooting against sunlight. After snapping interesting portraits we made our way under the first water fountain. Which was an explosion of light drops lit by sun setting light. 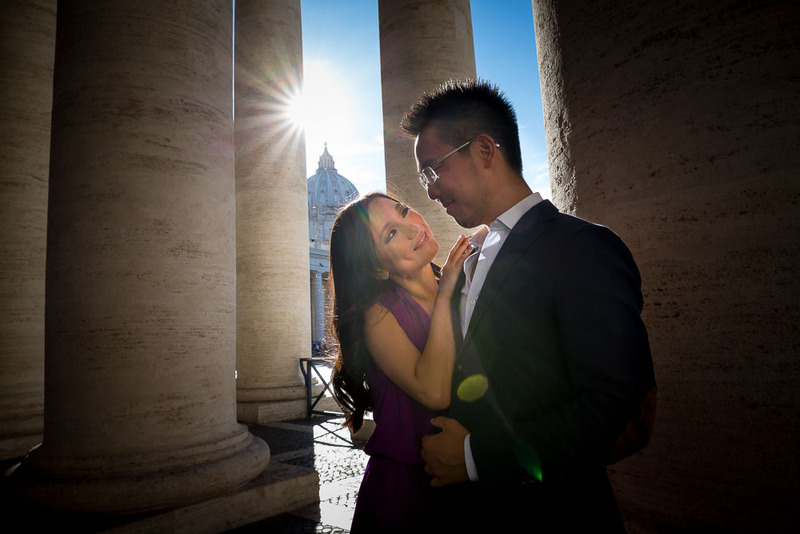 Then we headed in front of the Cathedral facade where we shot some more cool pictures playing with peripheral light rays. 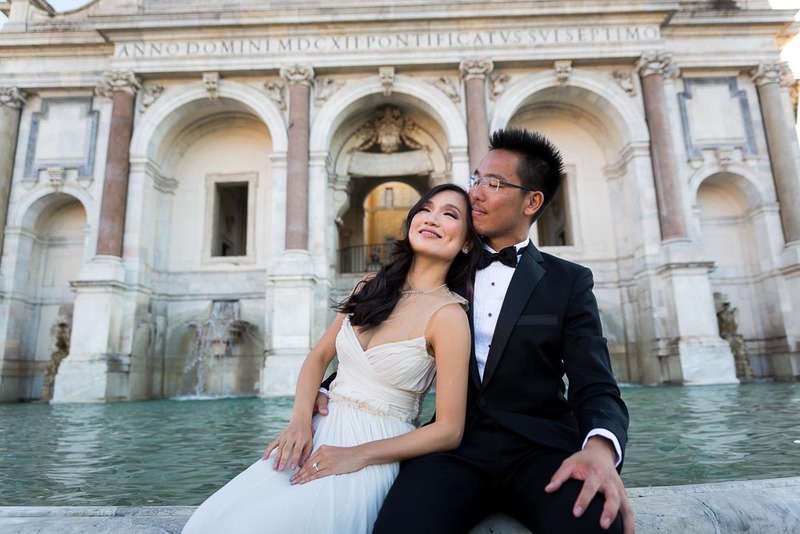 Thank to our very photogenic couple some really phenomenal images came out! On our way out we stopped by the second water fountain in the square. This time the wind must have changed and it was just a shower of tiny little water drops. A stunning effect came out as we were all getting a little wet. Including the camera lens which made some cool crystal effects on the photo. And a very refreshing feeling! 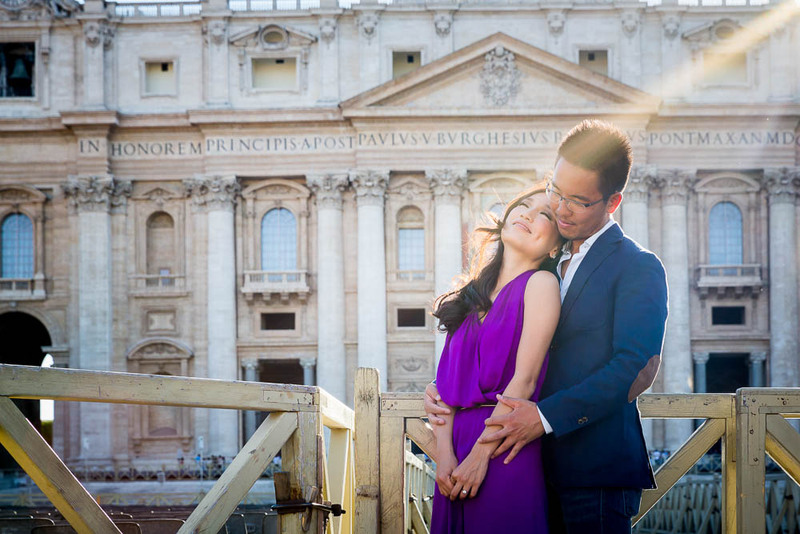 Great lifestyle engagement photography stuff! 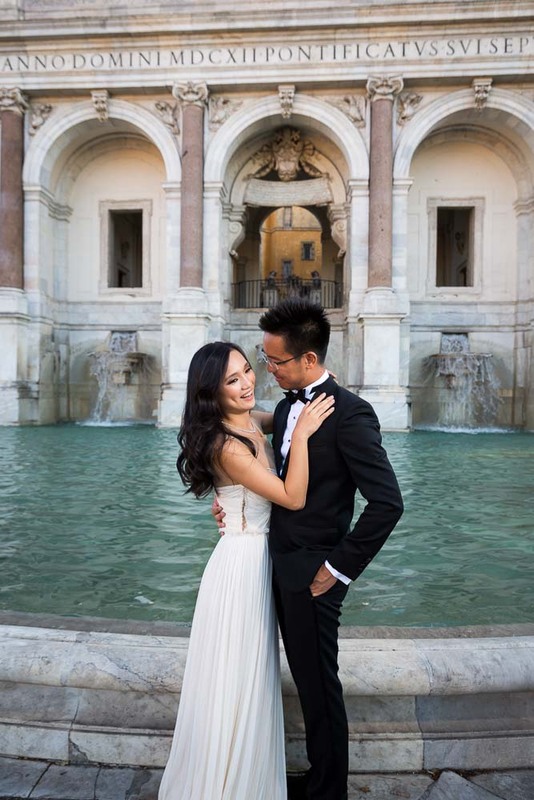 Just amazing images but we became invincible after the outfit change to a wedding dress and tuxedo! By now the sun was very low down on the horizon and we had just about 5 minutes to capture these photos before it went behind the fountain. Starting with the bench view over the Rome cityscape. 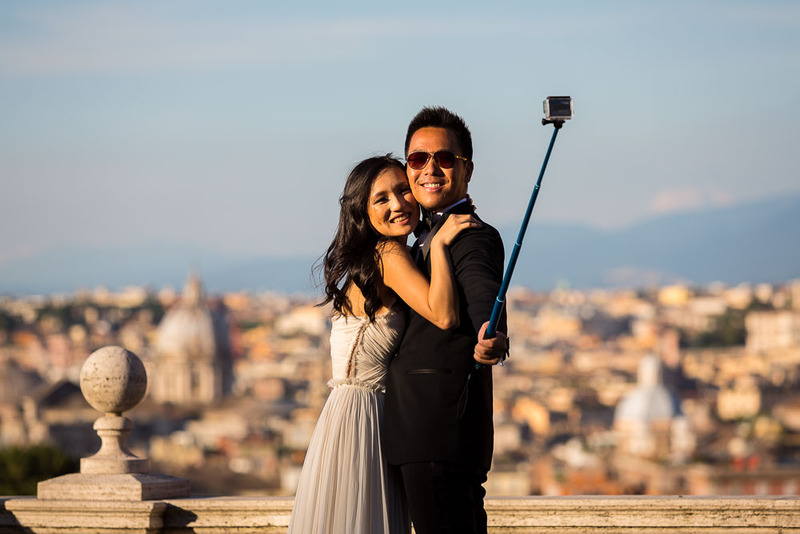 I was clicking away to some really beautiful imagery including a panoramic wedding selfie! Then we stepped back across the street and positioned ourselves on the edge of the Fontanone water fountain. 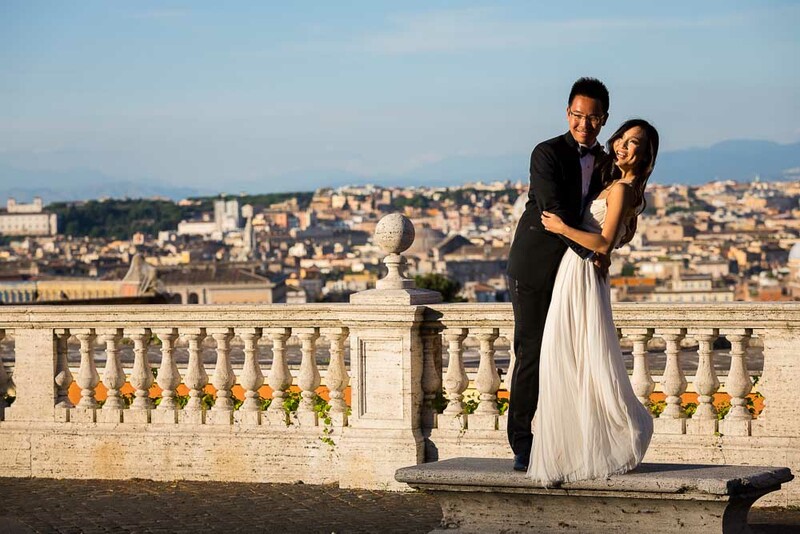 Again a great set of pictures with the wedding gown and tuxedo. Fun, relaxed, laid back and very much in love! 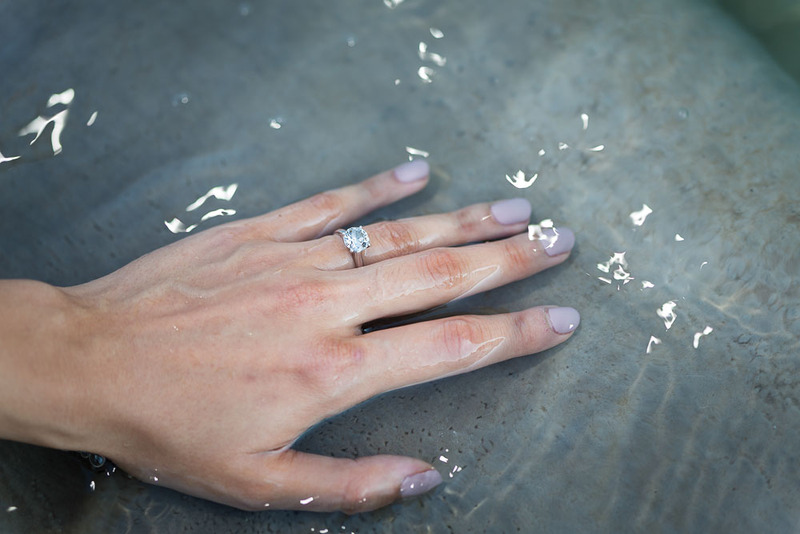 Before heading out we submerged the hand with the engagement ring in the water for some final shots. 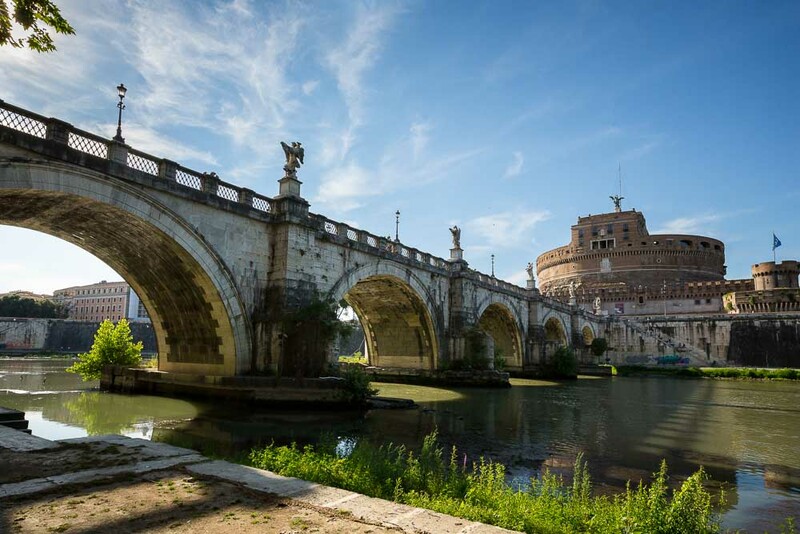 We continued towards the Roman Forum. 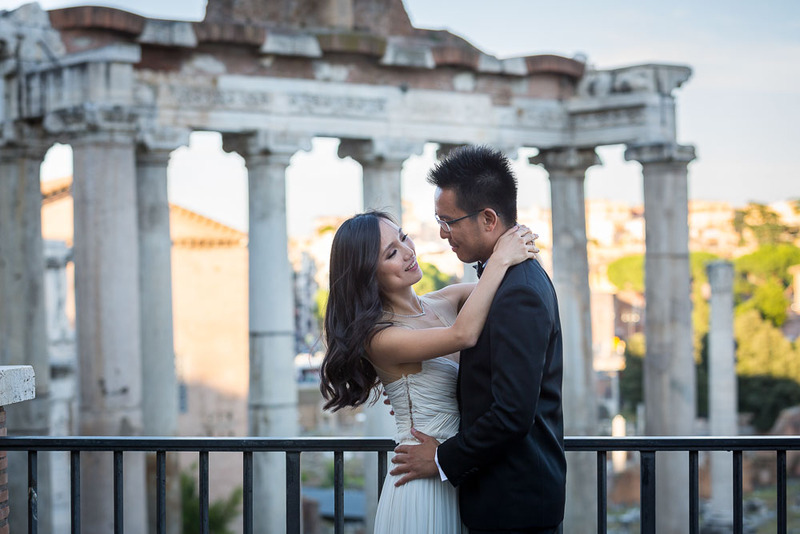 Taking pictures overlooking the spectacular ancient city of Rome from above. With the sun setting shining on top of a distant church dome. 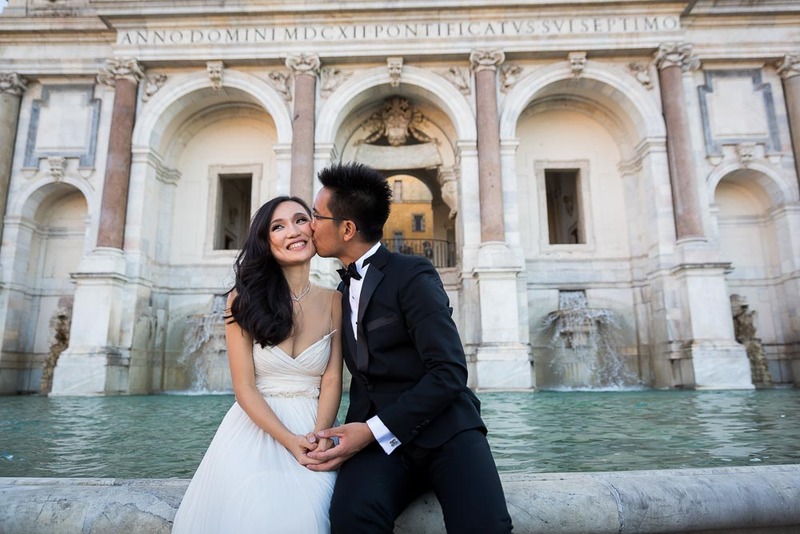 Then made our way onto the square itself stopping to take creative photography by the stairs and columns. Then we ran into a silhouette moment which we couldn’t overlook! The minivan was parked right by this fantastic sun setting view. After a quick change of clothing with switched to a bright red engagement style dress. So we decided to invest a little bit of time in trying to capture some silhouette pictures. The framing was a little tricky but at one point we came to finding a really nice view. Love how the light shines through the bright red dress. 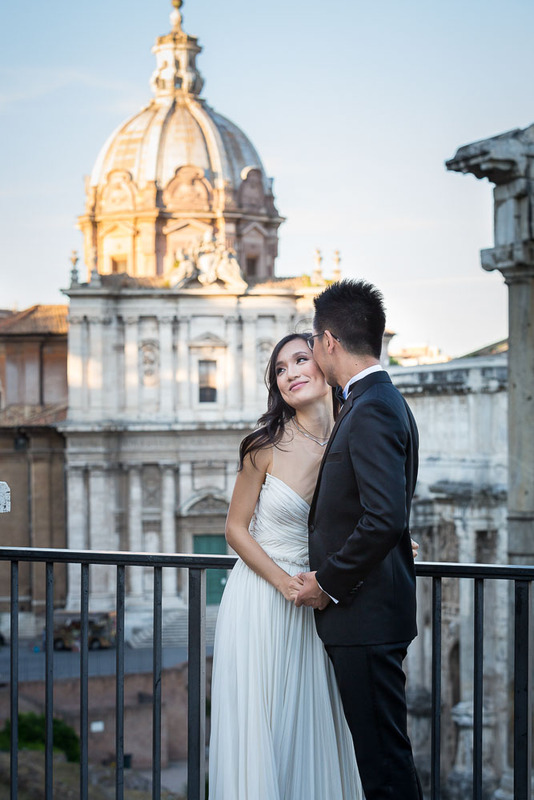 Then we stepped over the railing overlooking on a different side of Rome. Again trying to shoot against sunlight in the attempt to achieve dramatic high right tones images. Ok by now the light was officially gone. Sunset. We started shooting when the blue hour just begun. We had about an hour of this light and we tried to make the best of it. 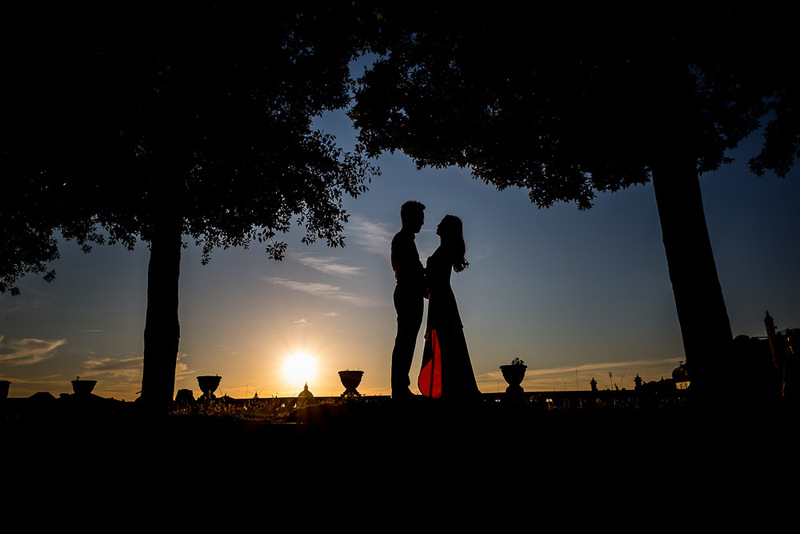 Alternating artistic silhouettes with creative lighting. Our wonderful couple was just fantastic. And I think this was reflected in the imagery that came out. Check it out!